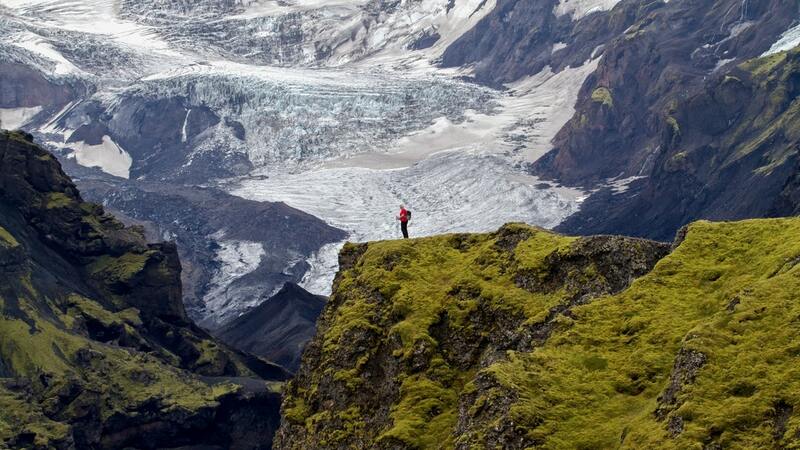 This 7-day trek from Landmannalaugar to Skogar was named one of the 20 best treks in the world by National Geographic and is the full Laugavegur experience. The other-worldly landscape will leave no one untouched. 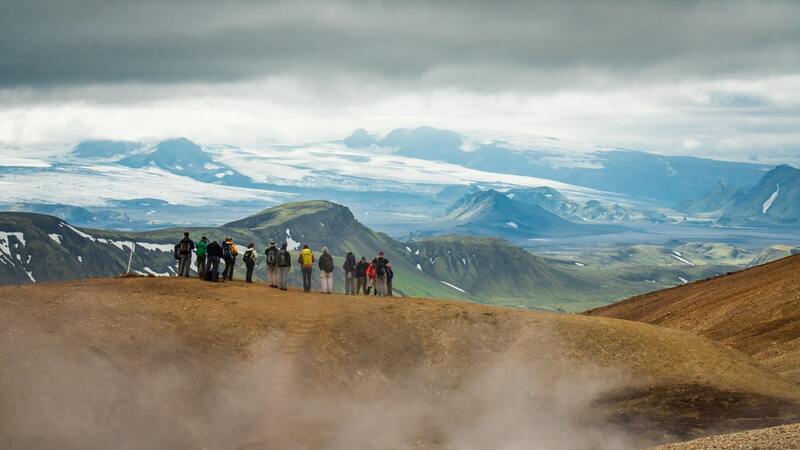 By combining two of Iceland’s best-known trekking trails, you get an unbelievable seven-day trek through incredibly diverse landscapes. From the famous geothermal area of Landmannalaugar to the ever so popular waterfall of Skógar. This path takes us through it all; over multicolored hills and black sands deserts, alongside small gullies and great canyons, through verdurous valleys, between glamorous glaciers, and past wonderful waterfalls. This is a memorable hike littered with contrasts giving you a chance to absorb the true spirit of this remarkable country. 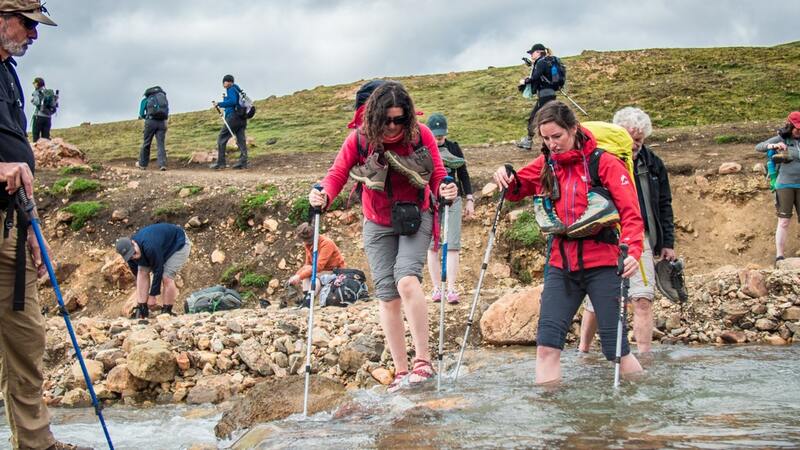 Accommodations will be provided in comfortable mountain huts and all luggage will be transferred along the trail except for the last night where we carry a light backpack to a hut hardly accessible by vehicles (sleeping bag included in the huts for the last two nights). Due to this trail’s popularity, there is potential for irreparable damage to the nature that we all enjoy. 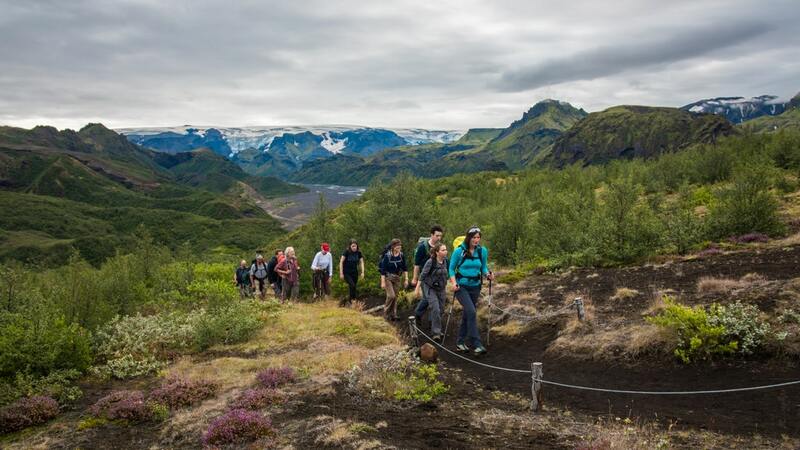 As environmental stewards in Iceland, we are taking a proactive approach to preserving the trail and the surrounding environment by allocating 1% of the tour price for each passenger to our Environmental Fund. With us, you get to experience this amazing trail and minimize your environmental impact. We take the regular public bus from BSI bus terminal, that during the summer months drives the mountain tracks that lead to Landmannalaugar, passing by the Hekla volcano and other volcanoes in the Dómadalur area. Arriving in Landmannalaugar at noon, we have a lunch and then head south into the mountains. The trail takes us past small gorges, steaming hot springs and yellow mountain ridges. We will arrive in the late afternoon at Hrafntinnusker mountain hut, where we will stay the night. We continue up and down through the small valleys and gullies of Emstrur, where the great Mýrdalsjökull glacier rises only a couple of kilometers away. At the end of the day, the vegetation starts to grow thicker and higher as we descend into Þórsmörk’s (the woods of Thor) green valleys filled with arctic birch forests and colorful flowers. We spend the night in one of the huts in Þórsmörk. 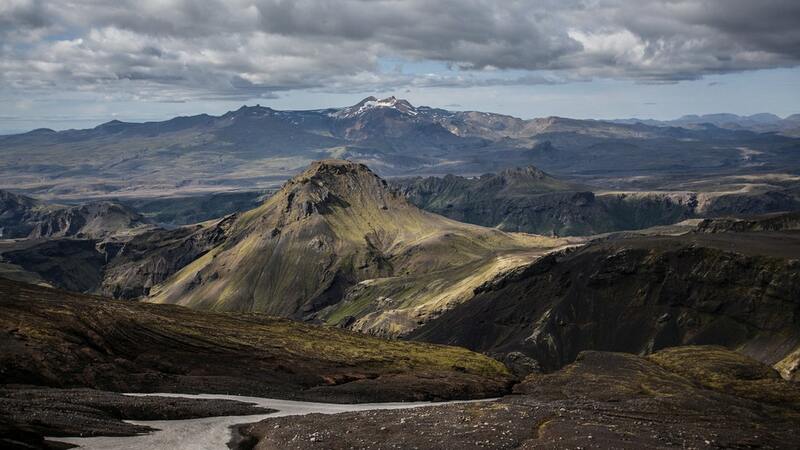 We spend the day in Þórsmörk where we have an abundance of choice between various paths. 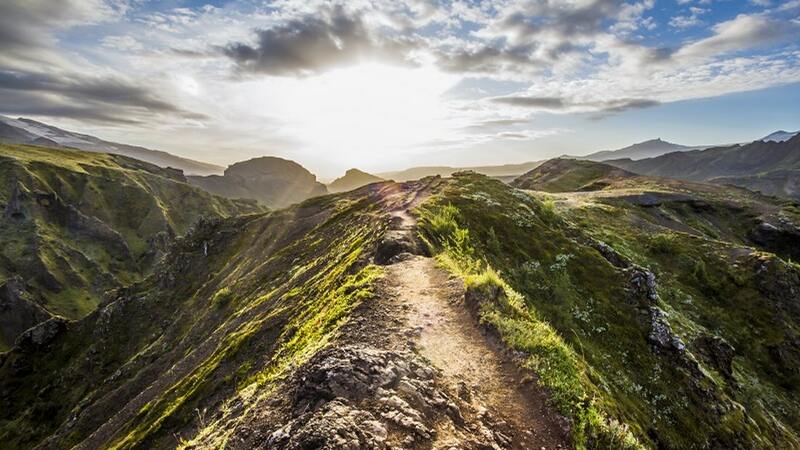 For example, we can visit the Sönghellir cave (“Song cave”), climb up the small mountain of Valahnúkur from where the magnificent view can be enjoyed, or hike into the beautifully carved canyon Stakkholtsgjá. This oasis between the mountains also an ideal place to relax and just enjoy nature. We spend the night in one of the huts in Þórsmörk. Leaving Þórsmörk we cross the river Krossá on a footbridge entering the magic landscapes of Goðalönd – the abode of the Gods. Nesting at the foot of two glaciers this is a wonderland of ridges and cliffs covered by a multitude of flowers and grasses, certainly fit for gods and humans alike. Even the elves have made themselves at home here. We continue up the hills leading to the pass of Fimmvörðuháls, walking along the Kattarhryggir ridges with views to the impressive mountain of Útigönguhöfði up to Morinsheiði heath. A the end of the Morinsheiði plateu we enjoy the view of the lava stream that flowed down from the Fimmvörðuháls volcano in March and early April 2010. The lava is all set with different outlets of fuming steam and decorated with green and yellow sulphur. As we gain height above Morinsheiði we come again to the lava and then to the two craters Magni and Móði that erupted prior to the main Eyjafjallajökull crater. We cross the brand new lava just at the foot of the magnificent red craters, through places were the lava is almost glowing warm inside the fissures and cracks on its surface. After crossing safely the lava we get a view to the lava and the craters from a hill on the other side, before crossing the néves of the high pass of Fimmvörðuháls, to get to the hut between the glaciers Eyjafjallajökull and Mýrdalsjökull, where we set up for the night. 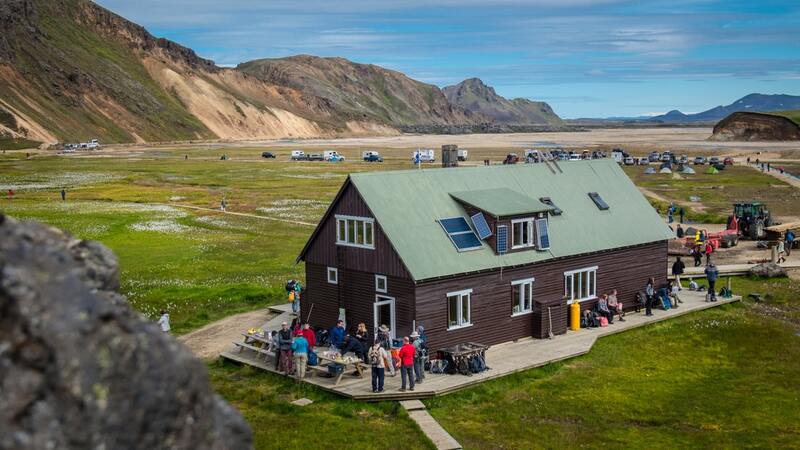 Note: Because of difficult access to the hut for vehicles, we will send our extra luggage to the end of the trek at Skógar. Food and sleeping bags/blankets have been stored in the Fimmvörðuháls hut so we only need to carry our sleeping bag liner and toiletries for the night and a little bit of fresh food. After a night between the two glaciers, we head down to Skógar. In the beginning, the path takes us over a desolate heath past an old hut that does not offer many shelters anymore. We come to the Skógaá River and follow the river exploring its many hidden gorges, and waterfalls all the way to the famous Skógafoss waterfall. The river and its surroundings offer great scenery. The coast seems to be within arm´s reach and you can almost feel the surf on your cheeks. Arriving at Skógafoss, we hop on the scheduled bus to Reykjavík. Arrival at Reykjavik BSI bus terminal at 7:20 pm, where the trip ends. *All of the mountain huts are heated, some have electricity and some have hot water. There are bunk rooms with single and twin beds, participants have to be prepared to share a bed with a stranger. Jacket with a good hood – windproof, waterproof and breathable. A duffel bag for the transport of your overnight gear between huts. Please avoid bringing a suitcase! (not necessary for IMG35-Þórsmörk-Skógar). River shoes – Walking sandals or old running shoes with a good grip are a good choice, along with a pair of warm socks or neoprene socks. Open sandals or flip-flops will not do the job. (not necessary for IMG35-Þórsmörk-Skógar). Light Sleeping bag. (For IMG35 Þórsmörk-Skógar only: only sleeping bag liner is needed as a basic sleeping bag is stored in the huts so you will not need to carry a sleeping bag). Casual clothes/change of clothes for wearing in the hut. It all starts with a tent and ends with a lifetime of memories. 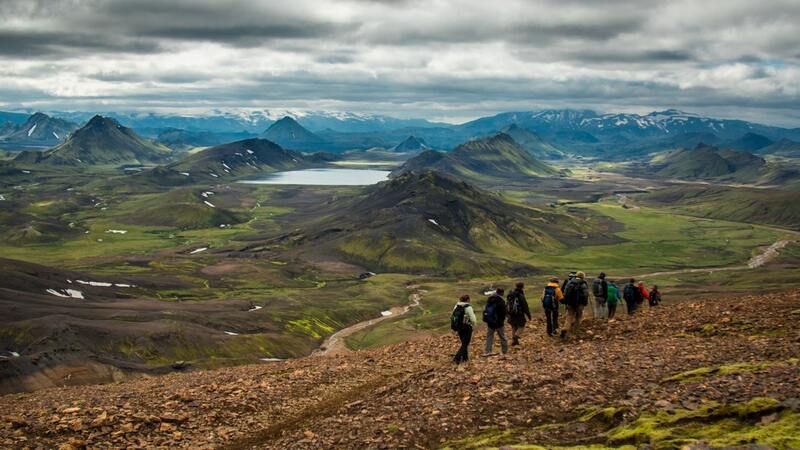 Camping for 4-days along the Laugavegur trail from Landmannalaugar to Þórsmörk is a unique experience that lets you connect with Icelandic nature on a deeper level. 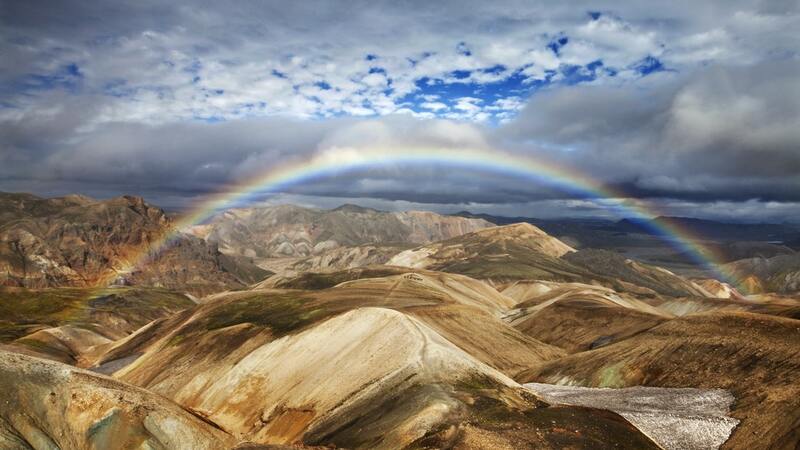 Iceland’s most famous trek from Landmannalaugar to Thorsmork lives up to the hype. The magical and diverse landscape combined with the long and bright Icelandic summer days will capture your nature-loving heart.